Learning to play the piano, no matter your age, has benefits that go well beyond the enjoyment that comes from being able to play. Now's the time to take the plunge and learn. Yes, you do have time. I teach lessons over the internet as well as locally so finding a schedule that works for you is no problem. Lessons on music theory (scales, chords, form, notation, how to read music), composition, arranging, Sibelius notation software, Reaper DAW, Komplete Ultimate (Absynth, Battery, FM8, Guitar Rig, Kontakt, Massive and Reaktor), or Band In A Box are also available. Scroll down for more. Testimonials from our current students are available upon request. Piano lessons are offered for ALL ages and ALL experience levels. As long as your child can read their lesson book, they are old enough to start. All styles of music are taught and supplementary instruction in theory, composing/arranging, lead sheets, accompanying and more are also available. My teaching schedule is great for homeschooling students too. Whether you want to help your child have an advantage in life or if you are an adult who never learned or you're someone who wants to start lessons again, NOW is the time to start. Don't put it off any longer. You are never too old to start. To get started taking lessons, contact us today! Have you been trying to learn to play the piano on your own and realized it just doesn't work? If nothing else, an experienced teacher can give you feedback to make sure you are learning to play the piano in the easiest and most efficient way! A book cannot do that. YouTube videos cannot do that. In my experience, few people are able to correctly learn to play the piano on their own. I also teach organ lessons. If you are interested in lessons, drop me a note and we'll figure out the best times. Lessons are also available wherever you live via the internet and can be scheduled at just about any time we are both available. Lessons are now available WHEREVER YOUR PIANO IS via the Internet! They continue to be available for face to face interaction for students who live in the Ocala and Gainesville areas and all places in-between. Here's a map of my Micanopy location. It is a short drive from Gainesville and Ocala and towns in between: Google Map of piano lesson location. I have had students who travel as far away as Lake City and southern Ocala to the Micanopy location. If you can't travel the short distance to take lessons face to face or we can't work out a good time, consider taking lessons via the internet. Whether you wish to take lessons via the Internet or face to face, the best way to reach us is to use the Music Lesson Inquiry form to let us know today! Are you finding it hard to learn on your own or from YouTube videos or expensive video tutorials? If nothing else, an experienced teacher can give you feedback and experience that you can't get from any other source. A book or a video can only do so much. In my experience, nothing beats learning one on one with a teacher. For more information, use the Piano Inquiry form. Please make sure your spam filters (and those of your ISP) do not block email from me or you may never get my response. I can send you additional information on taking lessons or arrange to set up an appointment to meet (at no charge to you). Internet Lessons If you can't attend lessons face to face, consider lessons via the internet. My Micanopy location is a short drive from Gainesville and not too far from Citra, Reddick, Williston and north Ocala. 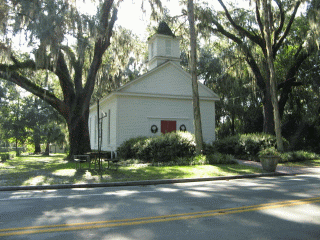 The Micanopy location features a concert-hall like setting and grand-piano. Lessons in Micanopy are cheaper than most Gainesville based teachers, so any extra gas expense should be covered by the lower cost. And don't worry; lessons at a church aren't any different than anywhere else. In fact, given the location, it is better than lessons in Gainesville. An article in The Scientific American, July 2003 stated that children with training in music have better verbal skills than those who do not. The article suggested that students with better verbal memory probably will find it easier to learn in school. Also noted is that the longer one studies music, the more the verbal skills improve. A recent study done by the National Association of Psychiatrists and Psychologists (NAPP) indicates that having hobbies such as ... music decreases the chance that one will be referred to a mental health practitioner by 24 percent. I have a book available! In The Shadows But Still In The Spotlight. An introductory guide to the world of piano accompanying. See details about the Book. Only $75 per month (for piano lessons). All costs are a flat rate per month for all piano lessons. Makeup lessons are available if you should choose to miss a regular lesson. Music books are the student's responsibility. There is no signup or materials fee.